"Clouds will be a factor all day Tuesday as a weak cold front enhances our marine flow and really makes for a thick overcast. That front could also touch off some drizzle or mist -- especially along the coast. Highs will be in the 60s all day." I always find it somewhat irritating when people look at this type of unusual weather and use this as a hammer against global warming when, in fact, this is the type of weather that will be more prevalent around here when the earth's temperature rises. Sure, we'll have more hotter days during the summer, but projections show that Seattle, on average, will get cloudier. If that's possible. It also grinds my crackers when people point out more inclement weather during the winter (high snowfall, etc.) as proof that global warming isn't real. I suppose it's counter-intuitive -- how can it be colder if the earth is getting warmer? Well, because the earth's weather patterns are complicated, to say the least, and some areas will experience more adverse weather at times. But, in general, the temperatures are higher. So, in short, maybe we'll only see Mt. Rainier a few days out of the year, but we'll be spending a whole lot more time in coffee shops (just not Starbucks). The media so often misses the point about warming 'trends'-meaning longer than one summer's worth of data! Down here in Texas everyone was real pleased with the cooler and rainier weather at the beginning of summer-until the rain didn't stop and tons of crops were ruined! Did you read the article yesterday from the environmentalist claiming walking to the store is worse for the environment than driving? Grrrrrr. So annoying! That's ok. We have enough warming here to make up for your lack of warming. LOL. We've got the same problem here in Houston. Mild summer last year -- didn't have a single 100 degree day that I recall (at least not at my house near downtown, although the official record may be different). Some summers we have week after week of 100+ temps. Same with this year. It has been unusually wet -- and therefore overcast -- with lower than normal temps. So too many people think that global warming is a joke after all, so why not sit in the parking lot with the Hummer motor running for 45 minutes while your wife goes grocery shopping? Perhaps more people need to call "global warming" what it REALLY is, which is "global climate change." I don't think anyone can deny that the climate is changing, and that it's changing everywhere. I try and use the term climate change as well. People definitely can tell the weather is weirder than ever, even if it's not always warmer than it used to be. It has certainly been warmer than usual for us this summer though, with about three weeks in a row with near or over 30 degree Celsius days. For northern-ish Alberta, that is weird. 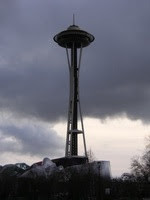 As a true Seattlite (who was born in MO, but don't tell anyone) I was nearly frolicking in today's weather. I even wore my new dress. I get so fired up over the denial people seem to be in. Especially those who make claims about the global warming conspiracists (whoa, how do I spell that?) getting rich over the issue. I'm still looking for my secret bank account, because I tell you what, I need it this month! Apparently when I get fired up I get sassy.